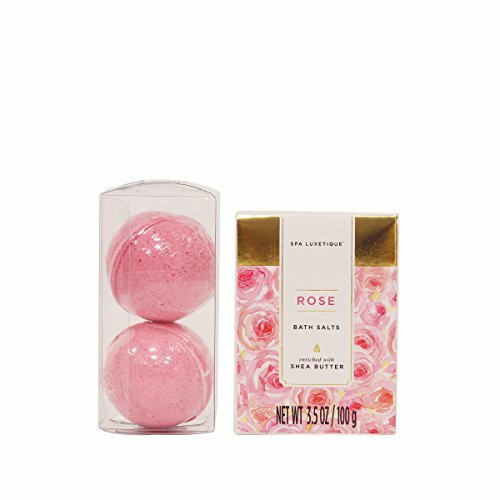 HomeShopGift BasketsSpa Luxetique Spa Gift Basket Rose Fragrance, Premium 8pc Gift Baskets for Women, Cute Bath Tub Holder – Spa Gift Set Includes Bath Bombs, Shower Gel, Body Lotion & More. Best Holiday Gift Set. 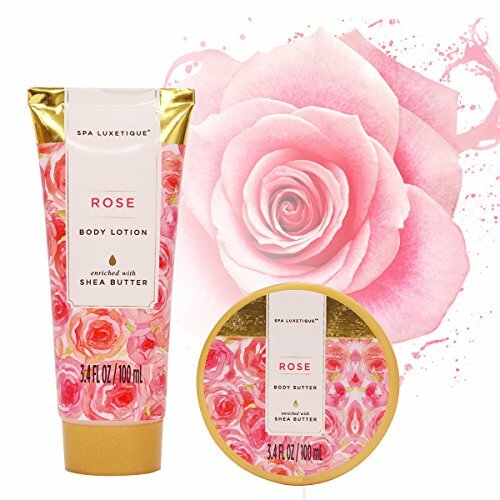 Spa Luxetique Spa Gift Basket Rose Fragrance, Premium 8pc Gift Baskets for Women, Cute Bath Tub Holder – Spa Gift Set Includes Bath Bombs, Shower Gel, Body Lotion & More. Best Holiday Gift Set. Natural & Effective – Our spa gift basket is made from the natural ingredients such as Sunflower Seed Oil and Vitamin E that helps to nourish the skin and lock in moisture. 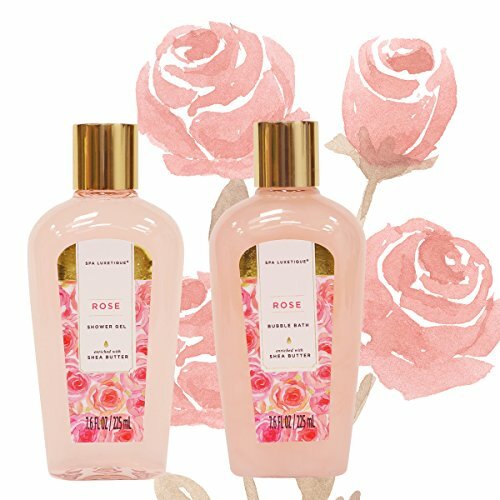 Sensual Rose Essential Oils – Inspired by the rose gardens in the English countryside, this beautiful Rose scent is floral, romantic, fragrant and long-lasting. Home Spa Gift Bath Basket – Item contains: 2 Bath Bombs, Shower Gel, Bubble Bath, Body Lotion, Body Butter, Bath Salt, Bath Puff & Gold Bath Tub. 7.9oz(235ml) shower gel – gentle and moisturizing cleanser. 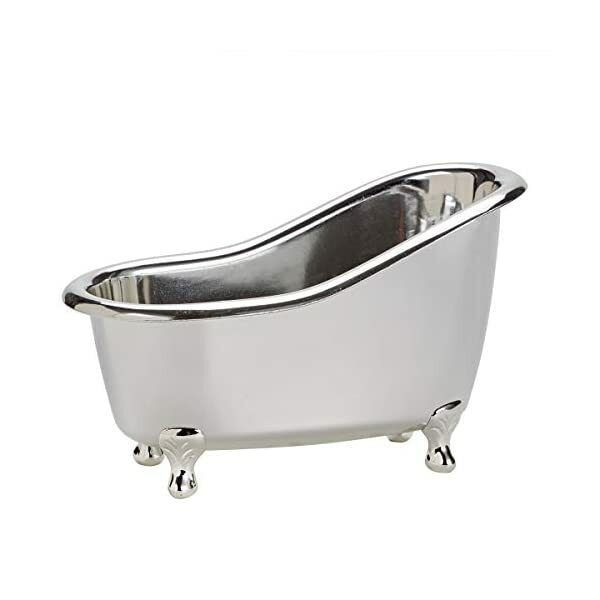 7.9oz(235ml) bubble bath – foaming formula for a relaxing bubble bath. 3.6oz(105ml) body butter – replenishes skin and locks in moisture for naturally radiant skin. 3.4oz(100ml) body lotion – nourishes and moisturizes body for silky-smooth skin. 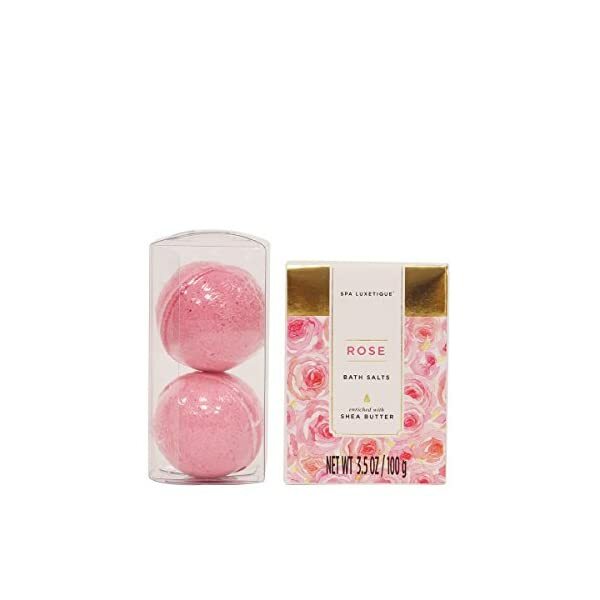 2*1oz(30g) bath bombs – ultra-fizzy and leaves skin soft and skin lightly scented. 3.5oz(100g) bath salt – relaxes and rejuvenates sores muscles and calms the mind and body bath puff- cleanses and exfoliates skin. bath puff – cleanses and exfoliates skin. Click the Add to Cart button now and treat yourself by getting the Spa Luxetique’s Rose Spa Basket TODAY! Versatile Tub – Our upscale and beautiful packaging is perfect as a gift or for your own indulgent pleasure. 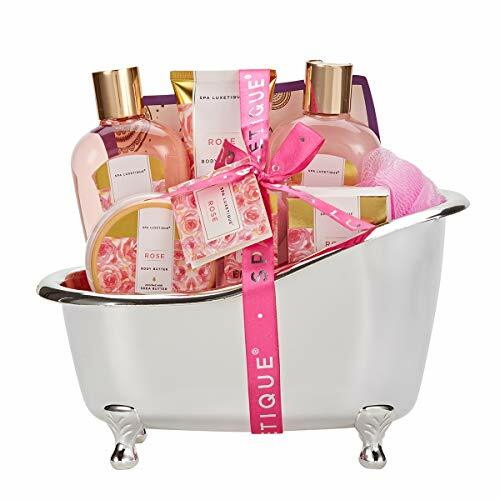 Have fun in the tub with a fragrant and delightful assortment of luxury spa products. 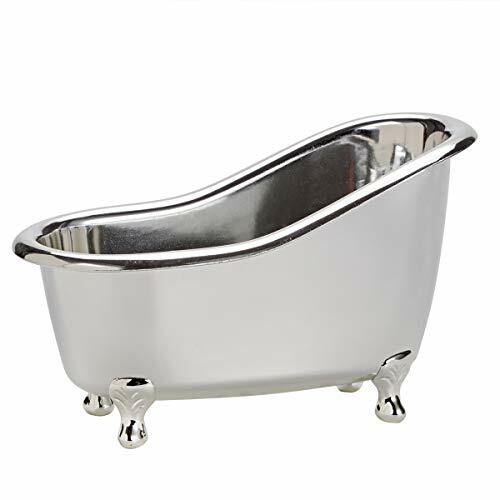 The tub can be used in many different ways such as storing a variety of items in a powder room, bathroom or bedroom. A Special Gift – Our exquisite packaging and premium products are perfect as a gift for yourself or a loved one. Great for Mother’s Day, Anniversary, Birthday, or for no reason at all! 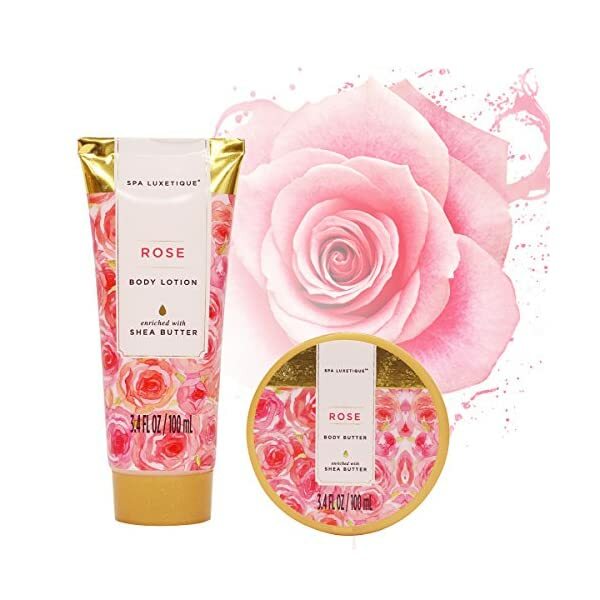 Specification: Spa Luxetique Spa Gift Basket Rose Fragrance, Premium 8pc Gift Baskets for Women, Cute Bath Tub Holder – Spa Gift Set Includes Bath Bombs, Shower Gel, Body Lotion & More. Best Holiday Gift Set.